This book will convict you to change your perspective on what it means to follow Jesus in the most dreadful places. Nik Ripken painstakingly describes his own suffering serving as a relief worker in Somalia. The story drastically changes directions after a dramatic wake-up call. The rest of the book is devoted to the Ripkens' journey to explore what it means to follow Jesus in the most heavily persecuted places, what he calls the insanity of God. This book caused me to explore my own thoughts and feelings on faith and suffering. 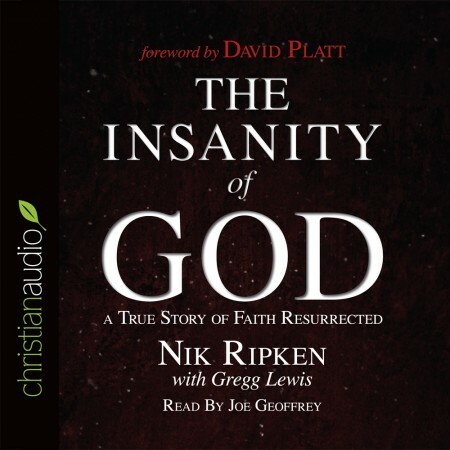 Nik Ripken declares that persecution for faith is not the worst problem for Christians, but rather being silent about the good news of the gospel of Jesus Christ. To be silent in not making disciples of Jesus is no different than Muslim persecution of Christians in the Middle East. Persecution will always exist so long as Jesus is being proclaimed in the world. A note on the narration, it was about average. I received this book from christianaudio as part of a reviewing program and was not obligated to write a positive review.